Lean distribution is about improving processes and driving out waste everywhere in your business operations. A well-designed lean distribution program can provide your company with the tools, cultural changes and systematic thinking required to continuously improve your standardized processes, to reduce waste, and to make your distribution operation run significantly better. MWPVL International has developed a structured program that helps companies to assess their distribution operations with unbiased expertise. The objective of a lean distribution program is to drive out all non value added activities and processes so that your customers receive the highest level of quality and service at the lowest possible operating cost. Are there non-value added activities taking place within the distribution operation that can be eliminated? Do these activities add value for the customer or are they in place for historical reasons? What alternative methods exist to eliminate non-value-added work processes? Is there waste in the form of time, materials or other resources that cause productivity rates to be reduced or operating expenses to be inflated? Is there a way to reduce or eliminate this waste? How are products organized within the distribution center? Are there ways to optimize the way that products are stored: to reduce the manpower required to store and retrieve goods; and to pick outbound orders? Is there too much motion and searching required to locate products? How can the amount of travel time and search time be reduced to eliminate waste? Is there an opportunity to reduce “distribution defects” by reducing pick/pack/ship errors? Are opportunities available to improve shipment accuracy, order fill rates and on time delivery? What type of standardized processes and technologies are available to enable improved customer service levels? Is there obsolete inventory or excess inventory being held in the distribution center? Are lean processes available to better control inventory and to reduce the amount of slow moving inventory being held? Are there opportunities to streamline the transportation shipping process for distribution operations that ship small parcels and LTL? Are package or load consolidation opportunities available? Is the transportation planning function engineered to be optimized? Are the ergonomics of the distribution operation engineered to provide a healthy working environment for the employees? What lean techniques can be applied to improve how people work and the safety of their operating environment? How can the quality of life in the distribution operation be improved for the associates that work there? 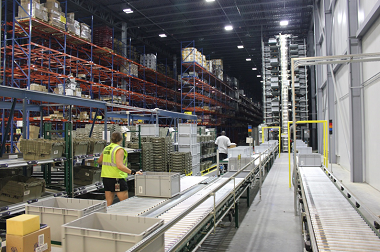 Are there opportunities to reduce warehouse space requirements by analyzing and optimizing slotting, rack elevations, storage media, warehouse layout, product flow, and operating processes? What performance measurements should be put into place to measure continuous improvement in the distribution center? What is the best way to measure shipment accuracy and labor productivity? How does your company's performance level compare to other firms and is your distribution operation as good as you think it is? How can activity based costing provide an understanding of where money is being spent at a transactional level? How can this information provide value when deploying lean distribution principles? Are labor incentive systems available to motivate employees to improve the quality and efficiency of the operation? Can incentives be used to encourage the contribution of ideas that help to reduce waste? How should these programs be structured - individual versus team-based versus gain-share? Elimination of waste – activities that add cost but not value. Implementation of a defects measurement as a strategy that focuses on process improvement and variation reduction. DMAIC (Define, Measure, Analyze, Improve, Control) process is for existing business processes falling below specification and looking for incremental improvement. DMADV (Define, Measure, Analyze, Design, Verify) process is for developing new processes or products at Six Sigma quality levels. Plan – Develop a plan for improving quality of a process and predict the results. Do – Execute the plan, first on a small scale. Study – Evaluate feedback to confirm or to adjust the plan. Act – Make the plan permanent or study the adjustments. Defined as a management philosophy that integrates all business functions (marketing, finance, design, production, logistics, customer service, etc.) to focus on meeting customer needs and organizational objectives. Maintains that organizations must strive to continuously improve processes by incorporating the knowledge and experiences of workers. Originated with a focus on lean manufacturing processes but has now expanded to all business processes. Unique to every business - aimed at the elimination of waste in every area. Goal is to execute the distribution function with less human effort, less inventory, less time to handle products, and less space requirements. Deliverable is to become highly responsive to customer demand while producing top quality service in the most efficient and economical manner possible. MWPVL International provides strictly unbiased lean distribution consulting services combined with a strong understanding of distribution operations, so that your company can implement a successful lean distribution program which is the first important step in the journey towards continuous improvement.